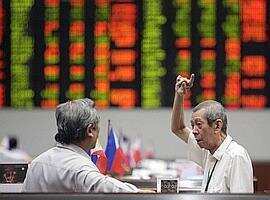 Talking shop: A file picture of two brokers at the Philippine Stock Exchange in Makati City, Manila. Hong Kong: Asian stocks closed mostly lower on Thursday as cautious investors braced for key US jobs data expected to provide clues about the prospects for interest rates. The Hong Kong market, which hit a record high earlier in the week, was among the biggest fallers, shedding 1.84% as investors fretted whether its recent gains were sustainable. Shares in Japan and Australia also fell after stocks had earlier sunk on Wall Street, with investors looking ahead to data due on Friday on September unemployment and job creation in the US. Good employment data could make US interest rate cuts less likely, dashing expectations of lower borrowing costs. A clutch of Asian bourses managed to rise despite the falls elsewhere, including the small Indonesian stock market. It rose nearly 1% to become the latest Asian bourse to hit a record high. Japanese share prices closed 0.62% lower, coming off a two-month high as investors took profits ahead of a key US employment report, dealers said. They said the market followed Wall Street lower amid uncertainty about prospects for US non-farm payrolls figures, which could be key to whether the Federal Reserve cuts interest rates again this month. The broader Topix index of all first-section shares fell 8.41 points or 0.51% to 1,655.60. Turnover dropped to 2.02 billion shares from 2.19 billion on Wednesday. Hong Kong share prices closed 1.84% lower, falling back below 27,000, as investors locked in profits after a recent rally, dealers said. The Hang Seng Index closed down 505.96 at 26,973.98, off a low of 26,746.63 and a high of 27,423.11. Turnover was HK$147.54 billion (Rs74,819 crore). Turnover dropped from Wednesday’s record high of nearly HK$210 billion but was still in triple digits as profit-taking gathered pace in late trade. “Investors have begun worrying about different issues—that’s why the market suffered a sharp drop for the second consecutive day," saidAlex Wong, asset manager at Ample Capital. While noting there is caution ahead of US jobs data, Wong said investors are also speculating about the reasons for the delay in the start of China’s programme allowing mainland individuals to buy stocks in Hong Kong directly. He said continuing delays in the launch of the scheme has prompted talk that mainland authorities might be putting in place some restrictions. Taiwan share prices closed 0.75% lower on profit-taking following recent gains and after Wall Street’s fall overnight, dealers said. South Korean share prices closed down 0.5% in volatile trading but were off their lows following the signing of an inter-Korean summit declaration calling for peace, dealers said. They said President Roh Moo-Hyun signed the declaration with North Korean leader Kim Jong-Il in Pyongyang, sparking expectations that tensions in the region would soon ease. The Kospi index ended 10.49 points or 0.5% lower at 2,003.60, after trading between 1,992.01 and 2,013.21. Trading was active, with 456 million shares worth 8.2 trillion won or $8.95 billion (Rs35,406 crore) changing hands. “The agreement contains a lot more than expected and this should be positive for the stock market in the long run," said Shinyoung Investment Trust and Management fund manager Huh Nam-Kwon. Huh said the joint declaration will significantly reduce the risk of war on the peninsula and the uncertainty associated with that risk. Posco tumbled 65,000 won or 8.5% to 700,000 won on profit-taking and disappointment with the Korean stock exchange’s decision to put the stock on “investment watch." Construction stocks remained in the limelight on hopes for an industry boom sparked by North Korean economic development projects. Hyundai Engineering and Construction jumped 2,900 won or 3.1% to 97,900, GS Engineering and Construction soared 9,000 won or 5.1% to 184,500, and Hyundai Industrial rose 3,000 won or 3.2% to 98,000. Singapore shares closed 0.78% higher, supported by strong gains in Singapore Airlines, dealers said. The Straits Times Index (STI) finished 29.19 higher at 3,783.81 on volume of 3.77 billion shares worth $2.74 billion or $1.86 billion. Malaysian share prices closed 0.2% higher as buying in some blue chips offset profit-taking amid investor caution, dealers said. The Kuala Lumpur Composite Index closed up 2.88 at 1,369.84. Thai share prices closed 0.19% lower as investors traded with caution ahead of the release of a key US September employment report, dealers said. The Stock Exchange of Thailand (SET) composite index declined 1.63 points to 848.95 and the blue-chip SET-50 index lost 1.59 points to 617.30. Indonesian share prices finished 0.9% higher after volatile trade, with the index closing at a record high on late buying amid optimism over corporate earnings prospects, according to dealers. The Jakarta Stock Exchange composite index closed up 21.57 at 2,473.16, off a high of 2,478.51. Philippine share prices closed little changed after last-minute selling by investors before an unexpected cut in interest rates by the local central bank, dealers said. The composite index was up 5.64 at 3,775.46, after moving between 3,732.89 and 3,801.30.